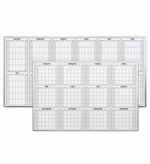 Full year dry erase calendars are the ultimate in visual planning, these large boards enable you to map out an entire year of planning in one place. You don't need to flip from page to page or enter information month to month. These calendars display the whole year's plans in an easy to read fashion. These are a great way to keep track of future events in a manner that is sure to help you and your team visualize the entire year. 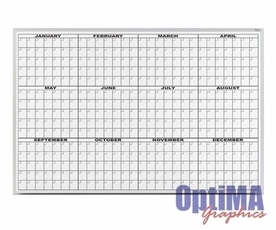 All calendars are printed with our exclusive Opti-Print™ method so that the graphics are embedded under the smooth high quality dry erase surface. Our 12 month magnetic calendar boards work great with magnetic accessories like our damp erase magnetic strips are great because you can move around and reuse magnets for recurring events. You can also opt for one of our economy 12 month whiteboard calendars while they are non-magnetic they do have the same great writing surface and best of all you'll save some money! The other option is to have us make a Custom designed dry erase calendar for you. We can add your company logo or make the calendar with your own design for a low one time art fee, there are no minimum orders! 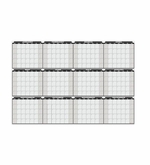 From "Size" "404-01: 4' Tall x 4' W (+$239.95)" "406-01: 4' Tall x 6' W (+$299.95)" "408-01: 4' Tall x 8' W (+$359.95)"
From "Select Size" "304: 31\" H x 45.5\" W Decal (+$79.95)" "406: 45\" H x 69\" W Decal (+$139.95)" "408: 45\" H x 93\" W Decal (+$179.95)"